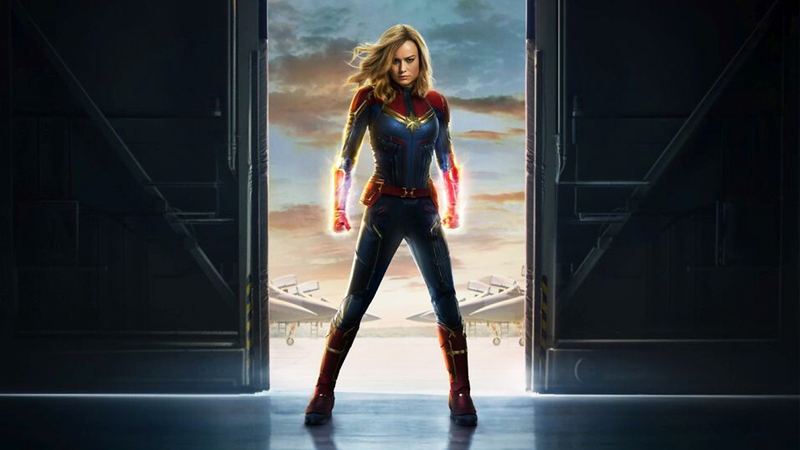 After some teasing images earlier this month, Marvel Studios has finally released the first trailer for Captain Marvel, which promises to play a huge role in the Marvel Universe as not only the first female-driven superhero franchise for the studio (Wasp got co-billing in an established franchise) but explains who and why Carol Danvers (Brie Larson) was the “cavalry” called by Nick Fury (Samuel L. Jackson) in the post-credits scene of Avengers: Infinity War when the Avengers fail to stop Thanos (Josh Brolin). The trailer need not explain that it takes place in the 1990s; it just needs to show Captain Marvel falling to Earth and crashing through the roof of a Blockbuster Video to set the date. If that’s not enough, we get a newly-rejuvenated Fury, reinvigorated about his work when superheroes and aliens show up. There’s only a brief glimpse of the Skrulls, but we get more Kree — some flying in space! — and shots of Larson wearing both the green uniform and the red-blue-gold “superhero” version we all know and love. Captain Marvel was directed by the team of Anna Boden and Ryan Fleck (Mississipi Grind), from a script they wrote with Meg LeFauve, Nicole Perlman, Geneva Robertson-Dworet, Liz Flahive & Carly Mensch. Lee Pace and Djimon Hounsou repise their Guardians of the Galaxy roles as Ronan the Accuser and Korath. Ben Mendelsohn, Lashana Lynch, Gemma Chan, Algenis Perez Soto, Rune Temte, McKenna Grace, and Jude Law also star.